I’m at work, sick as a dog, replacing the mounting bolts of our surround speakers in our mixing rooms. I hope everyone is having a relaxing and enjoyable holiday, and maybe even making music with their favorite synths!! When I get a minute or two I’m finishing up my final batch of OB-Mx voice boards that I started building over 6 years ago. I put them on hold since I didn’t have any CEM3374’s or CEM3382’s to finish them. But thanks to John Leimseider in Canada, and Vintage Planet, I’m going to have another 12 voice OB-Mx to play with. I have just recieved a shipment of ASR-10 SCSI boards, so if you’re interested send me a message with the contact form and let me know your PayPal address if different than your regular e-mail. The price is 299.00 USD plus shipping (10.00 USA and Canada, 15.00 rest of the world). I’m having my boards assembled at a factory now, instead of building them myself, so once I’m sold out it takes longer to get new ones. Here’s a short summary of where I’m at with my current projects. I’ll be moving (finally) and won’t be set back up until mid December at the earliest. That means that once the existing stock of kits is sold out, there won’t be any more until early next year. DSS-1 upgrade: 7 kits available now, another 20 after the new year. After that I’m going to focus on the DSM-1 upgrade. ASR-10 Digital I/O kit: 15 available. Still have to figure out the rack ASR problem with overheating. Prophet 3000 memory expansion: being beta tested. Basically working but having some issues with memory test giving false errors. Korg DSM-1 upgrade: Being researched, I’ve got the code around 30% disassembled and commented. After that I have to decide which microcontroller I should use. I’ll soon be moving to a new house, and until then I’ll be suspending work on all projects. I’ll have some upgrades available in limited quantities. Also, I’m currently preparing to have all my board assembly done by another company. I’m just not able to keep up with the backlog of orders. I’ve also sold out of the modified DSS-1’s. I won’t be selling any more of these myself, but I have several sources that can modify a stock one for you. I have around 25 kits left, and after that there won’t be any for a while, as I’ll be focusing my efforts on the DSM-1. Please feel free to submit ideas and enhancements. The Prophet 3000 memory upgrade will need some more R&D. It’s passing some tests and failing others. I’m not sure yet if it’s an issue with my board or the P3000, but it seems like the additional DRAM chips need to be buffered similarly to the original DRAM chips. Have to dig out the logic analyzer and see what’s going on. I’ve completed another batch of DSS-1 upgrade boards, but they tend to go pretty quick, so let me know if you’re interested. Also, I’ve just received another 30 boards for the ASR-10 SCSI upgrade. I’m now looking into having them assembled by another company. The reason for this is twofold. First, having the boards assembled on an assembly line is more reliable than hand soldering. Second, I currently only have 2-3 hours a week to do any sort of PCB assembly. 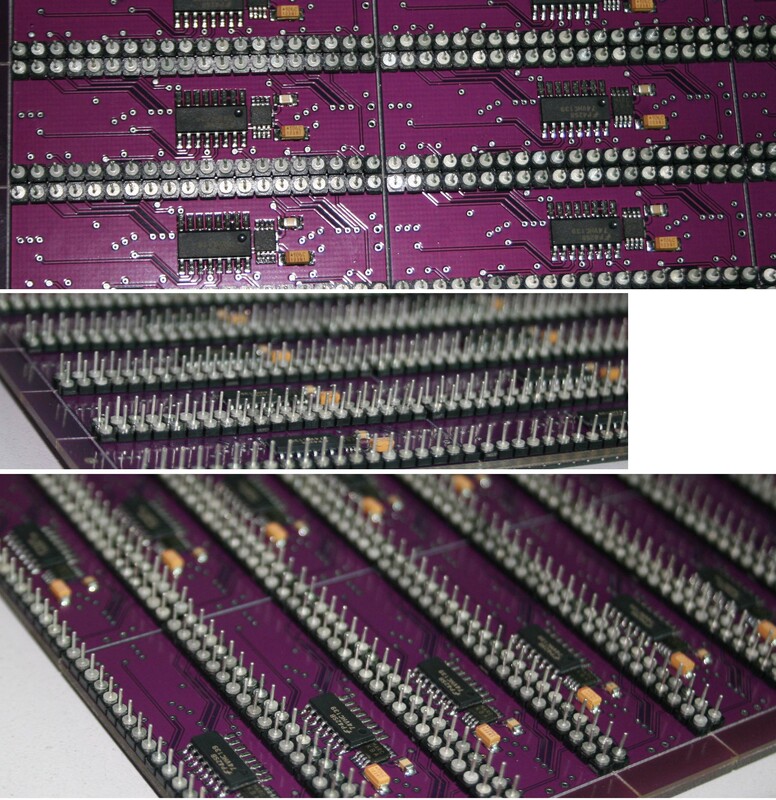 Each SP-3 board, for example, takes almost 2 hours to assemble start to finish. I’ve also had a couple of requests for the SP-4 SCSI board for the TS-10 and TS-12. If I have enough requests (more than 10) I’ll look into making those too.